Is the 27,200mamp device allowed in aircraft carry on luggage. A similar previous question was not answered clearly? BEST ANSWER: United Airlines allows power packs up to 160 Ah (amp hours). At five volts, the mAh rating can be up to 32,000 mAh. All these units are below that and so okay to bring on UA planes. They must be in your carry on bag or in your pocket and are not allowed in checked bags. I don't know if other airlines follow the same rules. The only airport that actually checked the rating of my power pack was Beijing China. As far as I know, there is no restriction specifically on power bank. I think because this battery is not know to explode like the Samsung Galaxy Note 7 and some Hoover Board (they do have specific restriction on this including on cruise ships). I personally have taken mine and use it in domestic and international flight without any problem. Hope this answer your question clearly. Since it's Lithium Ion, the rule on every airline I've been on is that you can't put it in hold luggage in case it combusts but you can take it on-board in your carry on. This applies to anything you have that has a Lithium Ion battery in it. Yes, I recently went on a trip to Thailand and had no issue with this in my carry on. The only thing you may need to do is remove it from the bag to have it checked separately. Just read the carry on max is 100 watt hours is for American Airlines. Check baggage is illegal. So at 5v...the max you can carry on the plane is 20,000 Mah foy AA. We are still charging this device, but the LED flashlight does not come on. Does the flashlight only work when the battery is fully charged? BEST ANSWER: No the flashlight works on mine even when the battery is almost dead. Some times I have to double or even triple hit the power button on the side to activate the flashlight light. This is an amazing power supply that lasts so long. I take this to the BWCA for a week and charge my phone and Bose Speaker to listen to music the entire week. I don’t even deplete the battery. I have never tried to to use the flashlight while it was charging. My battery appears to be working fine, charges and the flashlight works when activated. I'm sorry you are having problems with yours. The flashlight works as long as the battery has sone charge. Make sure you press the button twice to turn on light. Quickly double click the power button to turn on the flashlight. It doesn't require a full charge to work. Press the button on the side twice quickly to turn on and off. can you leave it charging all of the time? I wouldn't recommend that. Why can't you unplug it when it's charged? I keep mine in my briefcase. Sometimes a few months go by before I need it. It's always fully charged - you don't need to worry about self discharge. It seems to shut off after charging to full power. Is there a way to disable this? BEST ANSWER: I seem to have that issue with the cable that is plugged in. I usually hold the button that turns the light on and pull the cable in and out and it usually turns on. Not that I know of - but just hit the power button and it comes back on. What are the two different ports used for? I know one is 1.0mA & the other 2.0mA, but is one for phones & one for laptops? BEST ANSWER: They are both standard USB ports, basically the only difference is that 2amp port charges the devices faster. 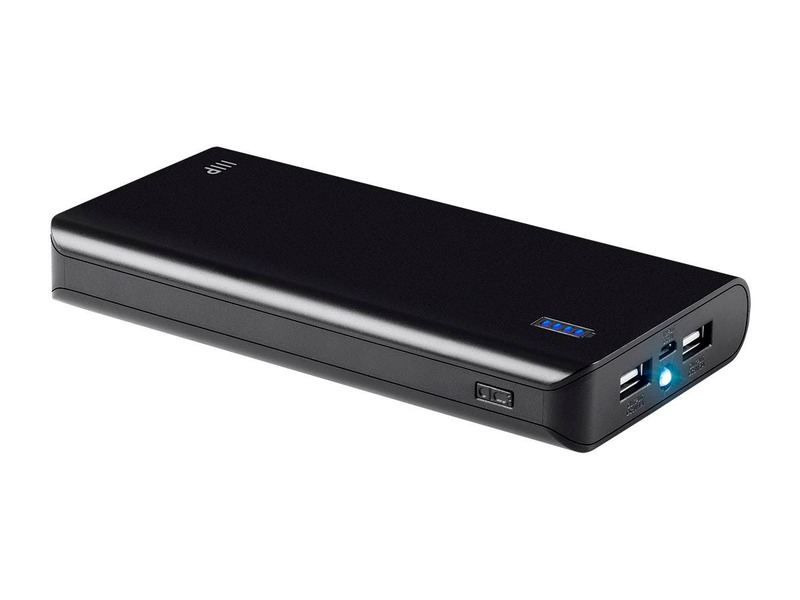 If you have a laptop that can charge off of a USB port, this would work as 27,200 mAh is a lot. 15124 - So where is the User Manual? BEST ANSWER: No manual needed. Plug and play, it's all automatic. You literally plug it in to charge it then plug your phone in to charge that. It also comes with a paper that explains the buttons. Why isn't there a USB Type-C variant? BEST ANSWER: That is a question for Monoprice, but I have 2 of these and they are great. I use a converter from to USB C that I bought elsewhere that works great. You may also buy the USB C cable (target end) which will work but you may not get the same level of charging that would come with a native usb C.
Easy workaround: Get the Palette Series USB-A to USB-C cord (your color choice, your length choice) and all is well in the world. is it pass-through (can be charged while supplying power)? BEST ANSWER: Hello, yes you may charge this will it is also supply power. Thank you! Can this charge two devices and be charged at the same time? BEST ANSWER: It can do so but if the power bank runs out of charge then it will stop charging the devices connected to it. 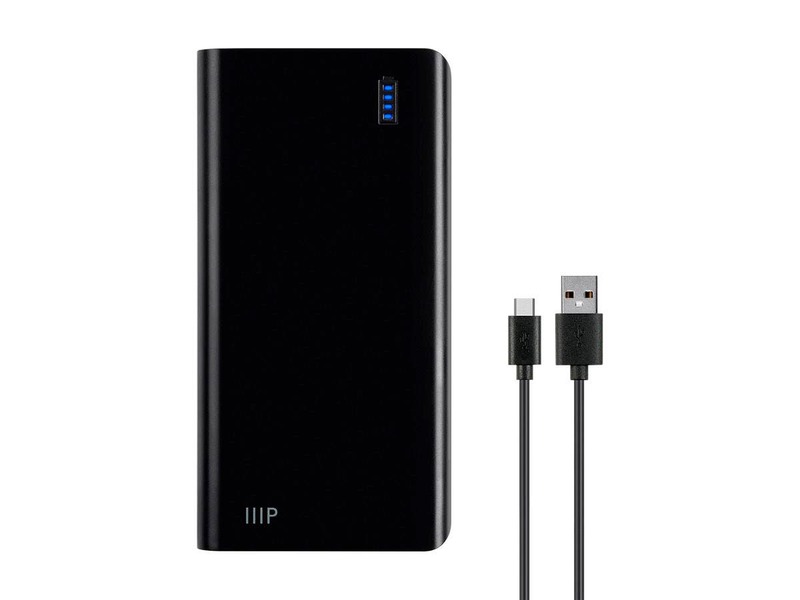 What is the Wh capacity of “27,200mAh Power Bank”? Thank you for your response. Unfortunately, Li-ion Batteries don’t carry 5V. They are mostly rated as 3.7V which is later is up-converted to 5V or more. Math would suggest 100Wh or less. Do you see any labels on back of this unit? Will this - 27,200mAh - work with charging iPhone 7+ and iPhone 5c's? About how many charges would I get? Looking to take a vacation in a backpack. BEST ANSWER: Yes. It will charge all your phones all day long. Will this device charge the new 2017 Pixelbooks? What are the dimensions of the 10000mAh charger? Why do the 16,000mAh, 20,000mAh and 27,200mAh all weigh the same and have the same dimensions. Shouldn't they be heavier and larger with higher capacity? Purchased this for an upcoming trip where access to power will be limited. Charging my phone with it right now and has not dropped a bar. 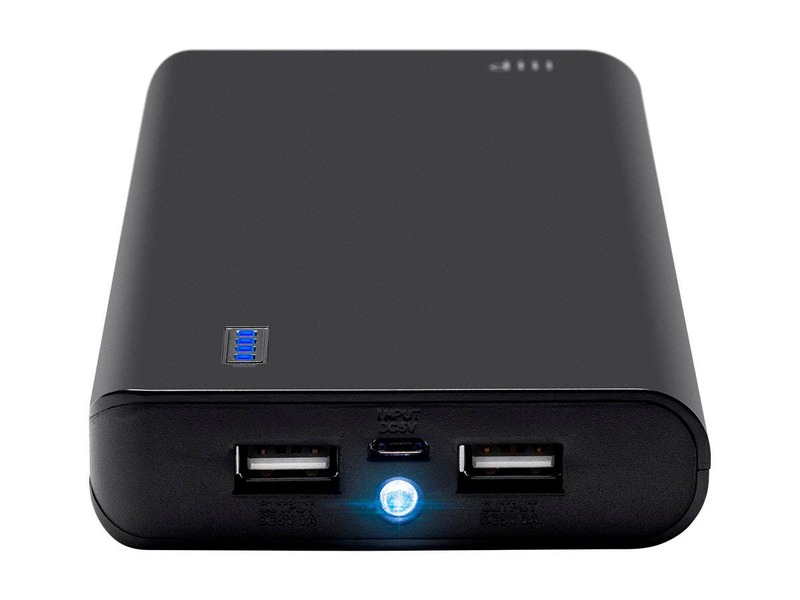 This has the same footprint of the 20000mah model but with a third more capacity. I can charge my phone and tablet for days with this thing. Well worth the low price and, as always, great Monoprice quality. Charged my iPhone XS Max and Ipad all the way and then used not he plane without losing any power! A lot larger than I thought it was going to be. That being said, this thing is a beast. Very solid build, and works great. Using it with an Galaxy s7 and gets it fully charged a few times before having to charge this unit again. Highly recommended. Just make sure you are ok with the dimensions and weight of this. Works as advertised! Used daily for a week in Manila to charge my iPhone without recharging the brick. 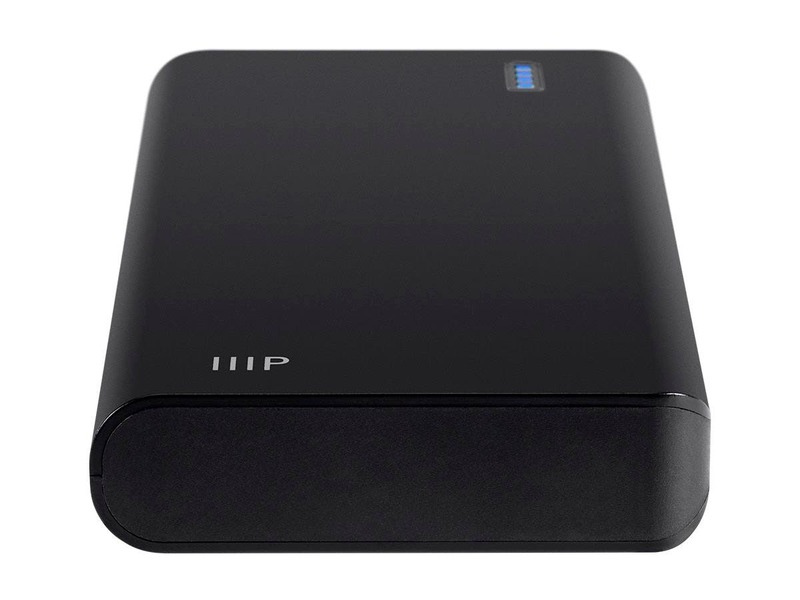 Excellent capacity in a relatively compact size. It does not support quick charging like some of the smaller capacity models but the 2v port is adequate enough. Much smaller than I expected and feels very dense. Highly recommend if you need something to go the distance with you. I ordered two of the 27,000 man versions of this charger. One of them was DOA. The button on the side did not work and would not charge anything when plugged in. Bummer. The other one worked flawlessly. I used it to power two camcorders for something like 10 hours straight. Even after 10 hours, the battery was still at half capacity. Awesome!I sent back the broken one and am looking forward to receiving the replacement. Hoping that the lemon was just a fluke.